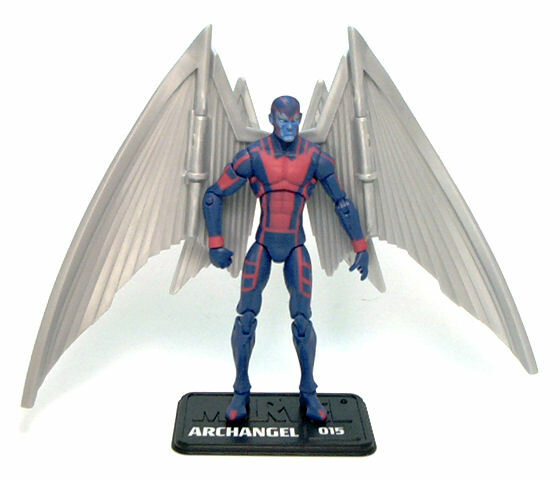 One of the most sought after figures in Marvel Universe Series 2, Archangel was a Fan’s Choice winner in 2009. 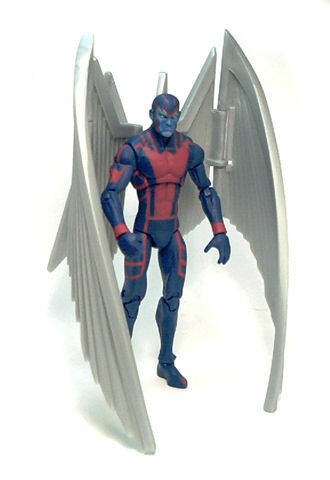 Archangel is based on the standard slim male body mold with a new head and some alterations done to the rear upper torso to accommodate the wing ports. The head sculpt is OK but doesn’t really have much personality in it, which actually kind of suits the depiction of the character in the comic books also. 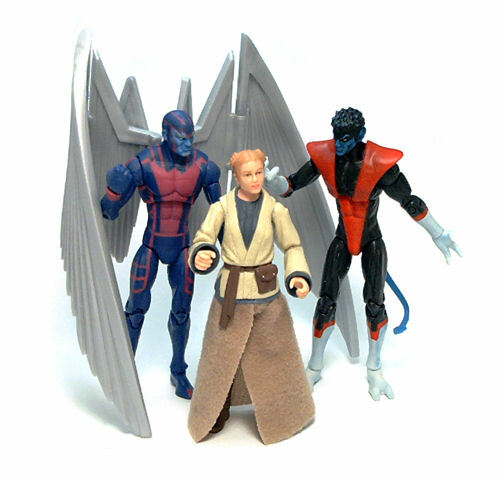 His life in comics has had it’s up and downs over the years; as Angel, he was a member of the original X-Men, and later was turned into a monster by villain Apocalypse after he ripped off his original wings. 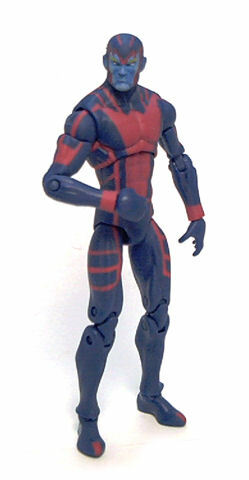 This version of the character comes from his late 90’s incarnation, shortly after he was freed from Apocalypse’s control. 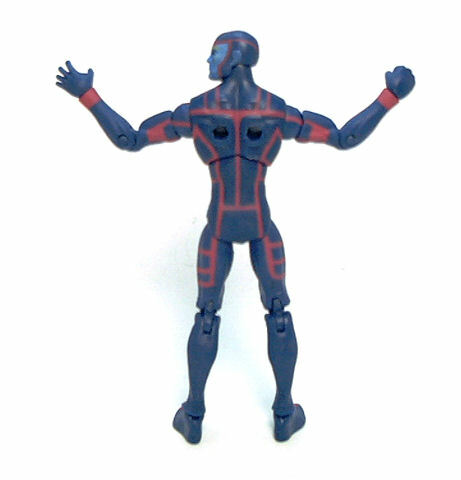 The figure is molded in deep blue plastic, with painted-on magenta lines on the suit and pale blue skin on the face. Some highlights were applied to the face drybrushing an even lighter blue to the raised areas, giving a rather chalky appearance to some of the figures I saw at the store. Each wings is formed by three hinged sections each with a round peg that connects the piece to the back of the figure. Two of these sections form the larger portion of the wing, while the third one works as an auxiliary flight surface of sorts. 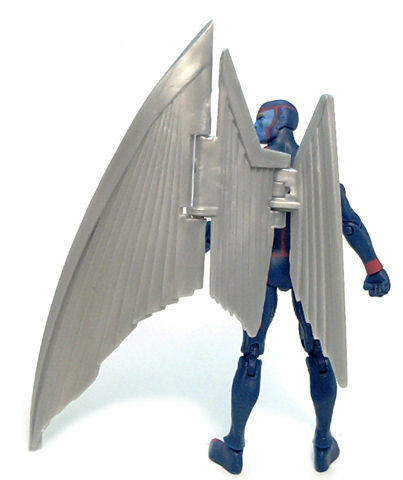 The wings are molded simply in silver colored plastic with no paint applications on them. 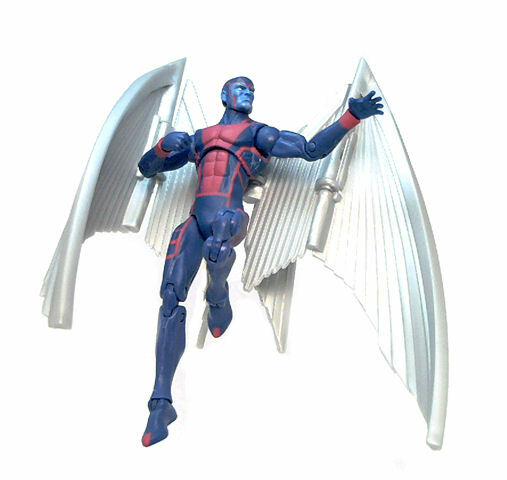 Even though the wings do add some extra weight to the figure, overall balance is pretty good and Archangel can stand unassisted even without the display base as the wings also serve as support for a variety of poses. • Ball jointed neck. Works mostly as a swivel. • Peg & hinge shoulders. The changes made to the upper torso seem to have impaired movement a little bit, as the arms cannot rest flush with the body. • Ball jointed hips. Restricted as usual. • Double hinged, peg wings. 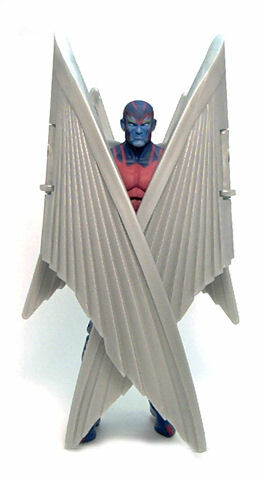 So, yes, Archangel has some articulation issues but, all things considered, this is still a very impressive character for the Marvel Universe line. As a matter of fact, while taking these pictures I became much more forgiving as the overall articulation did allow for more than just variations of the typical “standing with wings spread” pose. I still would have liked a way to have the wingtips fully extended to the sides, but that was probably not achievable within the budget. 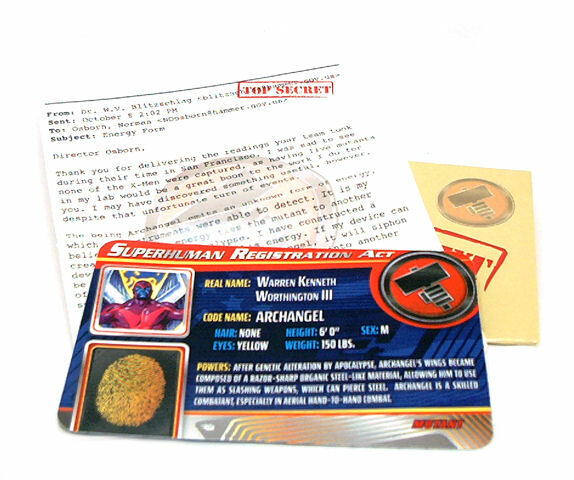 Other than the wings, Archangel comes with his HAMMER file envelope and a personalized black Marvel Universe display base. As usual, the information contained in the dossier is rather trivial, but the way it is presented is amusing, at the very least. 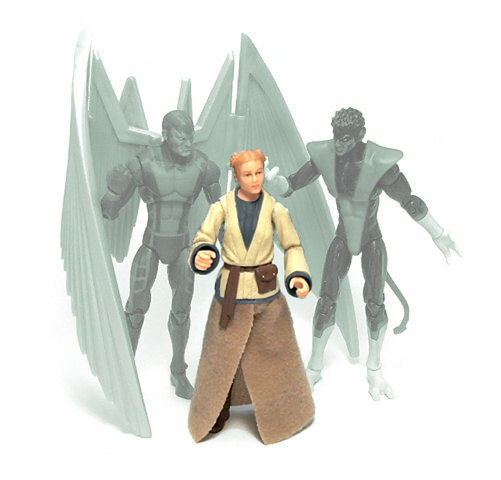 To wrap things up, I’ll say that Archangel is among the better efforts from Hasbro in this line, and I’d recommend you get him if you have the chance. I am still amazed of how far a couple of new pieces and a coat of paint can go into turning a generic blank sculpt into a full fledged superhero. Great job with this one, Errex! I kind of like the wings. Especially the fact they can wrap around him. Love the last pic, too.